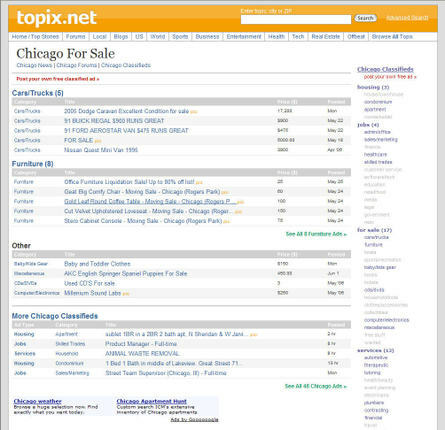 Topix.net, a news aggregator service owned by three large, traditional media companies, has added the ability to post free classified ads on its site. Topix offers a free alternative to both print and online classified newspaper sites, which have been banking on paid classified ads for years. Another direct competitor would be Craigslist, among others. You can see a screen-shot of the layout to the Chicago ads below. Obviously, the number of ads is limited, however, I expect them to pick up with time. "Our goal here at Topix.net is to help people connect better with their community -- whether that be where they live, or what they're interested in. We started by collecting news from all over the net and using technology to automatically tag it with geo-location and topic." I am a big fan of Topix.net and the moves that included the introduction of blog search results, mapping conversations and, most recently, a publisher platform. I think this move by Topix.net further hedges the bet of its old media ownership, which has been looking for additional revenue streams due to the decline in print readership. Maybe they should look to Topix because I feel Topix gets it.